A private entrance welcomes you to this wonderful 4-bedroom, 3.5 bath equestrian estate property situated on 5 acres with 48x36 center aisle barn, four 12x12 stalls, riding arena, round pen, 36x24 insulated outbuilding with electric and water and framed by 4-board fencing. 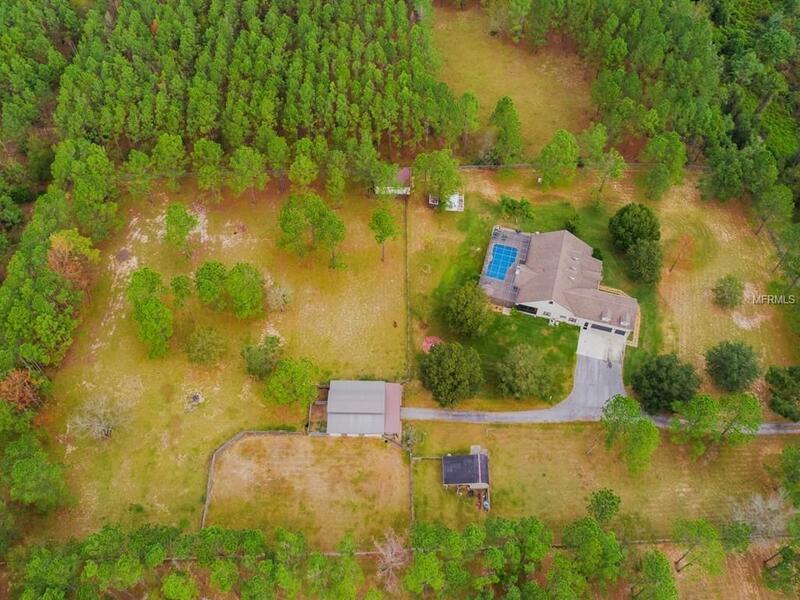 This home features eye catching curb appeal with large mature oak trees, tall stately pines, a rocking chair front porch and a brand new shingle roof. Stylish and comfortable interior with volume ceilings, formal living and dining room, large master suite with two walk-in closets and a huge second story recreation room with plenty of storage. The center island kitchen features beautiful granite countertops, hickory wood cabinets, and stainless steel appliances including a double oven. The family room features a vaulted ceiling and dramatic floor to ceiling wood-burning brick fireplace and triple glass sliding doors that open to the expansive stone paver lanai and sparkling inground pool with cascading stone waterfall. The barn includes a feed room, tack room with half-bath, stalls with automatic waterers, swing feeders, wash rack area and a second story hay loft. Fenced and cross-fenced with two irrigated pastures and Argentina Bahia grass. This is a one-of-a-kind pastoral estate where one can enjoy a slice of the good life and all just minutes to town and shopping. Pet Restrictions Goats Pigs And Chickens Are Allowed. Swine Farms Are Not Allowed.